Why is it when people get together the conversation always seems to turn to the dead? Well not all people just morbid ones. Our little clutch seems to border on the morbid at times as seen by my first Coffee Clutch page conversation about Saint Peter and Grandma it can be pretty funny. So as I was reading my newly acquired “The New Annotated Dracula” read in one of the foot notes that in Germany during the 1800’s they had what were called “dead houses” or what we would call a morgue. 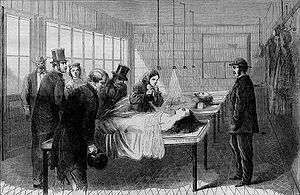 It was a law at that time in Munich that all dead bodies were to be laid out for three days in the dead house. Each adult corpse had a ring on his thumb with a string tied to it that was attached to a pulley that was attached to a bell. This bell could then ring in the attendants room if by chance the body were to move in any way. Thus saving a person from a fate worse than death, so to speak. 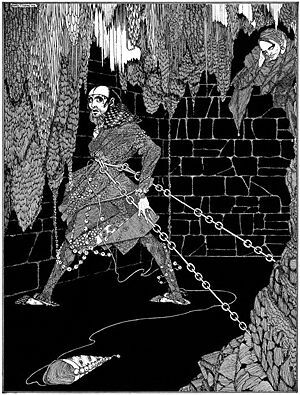 I was reminded of Edgar Allen Poe‘s story “The Cask of Amontillado.” This story revolved around a person being buried alive. I must be sure to relate this ring and string solution to my friends the next time we get together for our coffee. Who knows it could become a trend in the backwoods of their provinces.